Norway has some of the most beautiful national tourist routes in the world, and that natural beauty in one of Norway`s greatest assets. All together Norway has 18 National Tourist Routes which has put Norway at the forefront of nature tourism. Together making up more than 1,850km of roads. Each of the scenic routes has its own collection of lookout points, visitor centres, bridges, sculptures and installations - designed to guide visitors to the best experiences. Driving is one of the best ways to discover modern architecture and experience inspiring fjords, mountains and coastal scenery. In addition to the National Routes, you will also find many other local interesting and exciting routes all over Norway, where you have the opportunity to discover the amazing country. The Atlantic Road is a 8-kilometre long stretch of road located between the towns of Kristiansund to Molde. You will find The Hardanger National Tourist Route is a beautiful 158-kilometre-long stretch of road. Visit one of Norway's most beautiful hiking route across Besseggen Ridge. 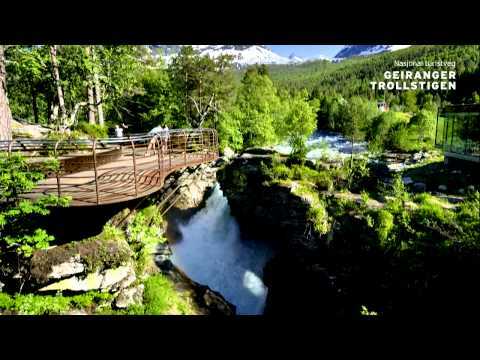 Jotunheimen National Park is characterised by high mountains, glaciers and deep lakes. The area is part of the southern most wilderness in the Nordic countries. Romsdalseggen is one of the most beautiful and popular hiking trails in Norway. The mountain is probably one of the most popular peaks to hike and climb in Norway. For more than 200 years people have climbed to the top here. This elegant and traditional manor house hotel is located just 18 km from the world famous Geirangerfjord. In Balestrand, beautifully located beside the Sognefjord, you find Kviknes Hotel. The Kvikne family, who own the hotel, took over in 1877, marking the start of fast-paced development, which continues to this day. The hotel was built in the Swiss chalet style; the original character of the place has been left unchanged despite several new buildings, rebuilding’s and extensions. Discover Flåm Railway - one of the most beautiful railway lines in the World. Railway Tour starts and ends in Flåm.